For the consumer of US corporate media, the idea of a nuclear armed North Korea is a terrifying threat. Almost every day for the last two weeks, print and television media have amped up the potential danger of a devastating military strike from the isolated peninsular nation. The North Korean government is not operating in a vacuum. Yet the reasons for North Korea’s militarization—the country has the fourth largest army in the world—and the historical context for its conflict with the United States are seldom honestly discussed in corporate media. The Korean War, in which the United States invaded the North on behalf of South Korea, claimed the lives of over 2 million North Koreans. The US dropped as many munitions as it had dropped on the entire Pacific Theater in World War II—a four-year conflict ranging over tens of millions of square miles, as opposed to the 46,541 square miles of North Korea—and the war has never been officially ended. We’ve become very confused in the United States, because the mainstream media like to exaggerate the North Korean nuclear threat, but we never get news of what the US has been doing over the past decades. And we should be very clear that what this is all about is actually US nuclear first-strike advantage against North Korea, and North Korea reacting to that by developing its deterrence capability. The US and South Korea hold annual joint military exercises on the North Korean border—exercises that are explicitly rehearsals for an eventual invasion of the North. As recently as September 23, the US sent a bomber off the North Korean coast—a show of force designed to ratchet up tensions. It would be good if the corporate media used some of their much touted but little practiced objectivity to make this context clear to audiences. “President Trump brought the same confrontational style of leadership he has used at home to the world’s most prominent stage,” the New York Times (9/19/17) reported. President Donald Trump’s September 19 speech at the United Nations, in which he threatened to “totally destroy” North Korea, fueled the conflict between the two nations. The president’s statement was criticized in the corporate media for its bellicose and aggressive nature—but as with many of the president’s actions, it was the tone and not the substance that was so offensive to the nation’s news providers. 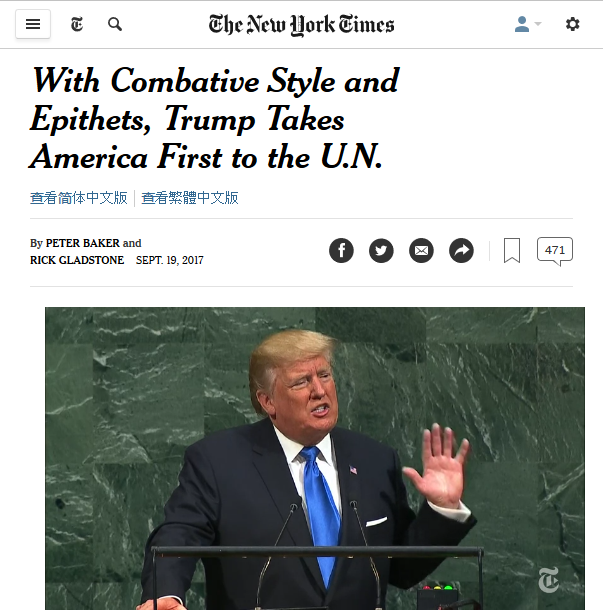 The New York Times (9/19/17) called that a “confrontational style of leadership.” Vox‘s Alex Ward (9/20/17) described Trump’s remarks as “belligerent rhetoric.” “Trump’s perhaps oddly chosen colloquialisms masked what was a pretty astounding escalation of his rhetoric when it comes to North Korea,” said the Washington Post‘s Aaron Blake (9/19/19). Yet even with the acknowledgement that Trump had gone farther in his language than his predecessors, corporate media ignore the context in which these threats are made. US news reports don’t reflect the history between the two countries when they write headlines like New York magazine’s “Wait, Are We at War With North Korea Now?” (9/25/17). And that lack of historical context can lead to the San Diego Union-Tribune (9/22/17) publishing an opinion piece on “North Korea’s Weird History of Insulting US Officials” without confronting the history of the two nations that might have led to that language. Though North Korea surely provides excuses for bombastic rhetoric and threats from America, the power differential is obvious to anyone who is paying attention to the tensions between the two countries. The US controls the majority of the earth’s oceans, has military bases in over 70 countries, and possesses enough firepower to destroy the world many times over. By contrast, North Korea has an antiquated military (regardless of its large number of soldiers) and essentially one powerful ally in China—a country that just this week joined the US in imposing economic sanctions on North Korea. Since , what the United States has tried to do is stall North Korea’s nuclear development, tying it up through negotiations that basically went nowhere, at the same time constantly threatening to bring about North Korea’s collapse, through sanctions that were crippling its economy, and also military exercises that were very provocative. They simulate war plans that now include the decapitation of the North Korean leadership, and include nuclear first strike. In short, North Korea is isolated and on edge. The insular regime faces a major threat to its south and an over six-decade faceoff with the world’s most powerful country. That doesn’t excuse North Korea’s actions — firing missiles over Japan isn’t a productive move — but it does provide context for decisions made by North Korea. As long as US corporate media ignore that history and the power differential, the “threat” to the US from North Korea will be overhyped, while the actual military might of the US is downplayed. Eoin Higgins is a journalist and historian from Western Massachusetts. You can find more of his work at eoinhiggins.com and follow him on twitter at @EoinHiggins. Reprinted, with permission, from FAIR.